Kaitlin C.: "it is super easy to hoist our bikes up when we are not using them. In the winter it is great, they are out of the way and I don't even notice them. In the summer, sometimes I don't always hoist it back up everyday but I always have the option." Bike Guy: "this is a great pulley system to get stuff off the ground in your garage. I bought one of these about eight years ago and another a week ago for a second bike. The first one is still perfect." 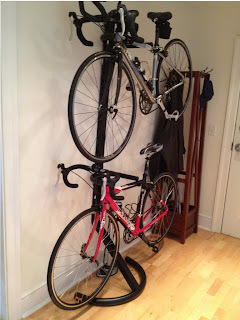 Double Vertical Bike Rack: this rack is designed so that it doesn't have to be screwed into the wall but still gives you a robust rack that stores two bikes, one above the other, saving valuable storage space. But, as a back up, this rack is made to be easily screwed into a wall, which some of our customers suggest doing if you store two bikes on it. Another great feature is that the rack arms that hold your bikes are adjustable - they can be moved up and down the center column of the rack to space your bikes as needed whether they are mens' or womens' bikes, beach cruisers or road bikes. With this rack, you store two bikes in the space that, without this rack, you're storing one. Great for apartments, too. Grant: "This went together in 10 minutes. In fact it took longer for me to decide where to put it than it did to put it together...Mine holds two bikes perfectly. Each side of the holders are separate so you can easily have on higher than the other for bikes with slanting cross-bars." P. Gray: "This vertical option was perfect for us. It cleared up a good bit of room and generally made getting our bikes in and out everyday much easier. We did not bolt this to the wall, because it leans up against the wall, and doesn't really wobble around too much. 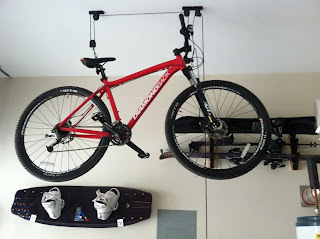 Check out the rest of our bike storage racks!